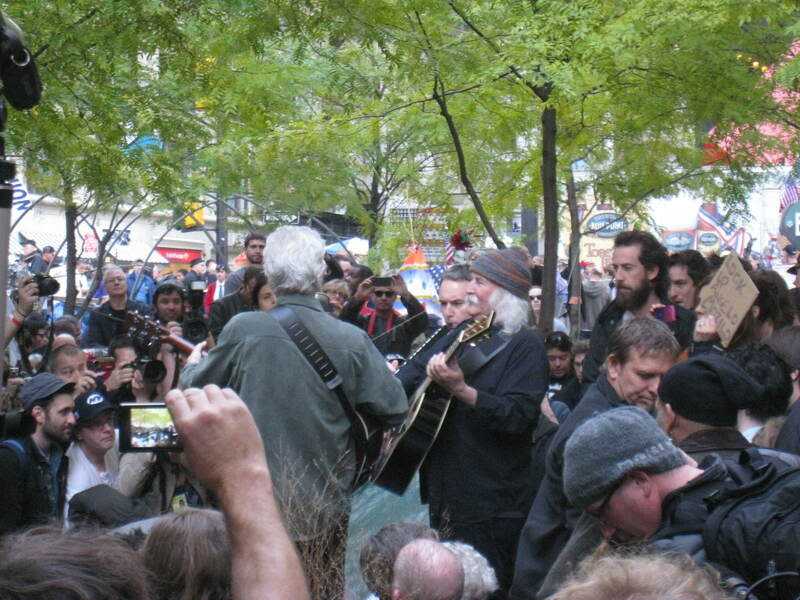 David Crosby and Graham Nash appeared and performed in Zuccotti Park this afternoon to a couple hundred people. Without amplification – both for instruments and vocals – it was difficult to hear them, but they were audible enough to hear their melodious harmonies (even though they were missing the third of their triumvirate). As they were playing songs of protest, it was hard not to imagine it was 1968 where groups of longhairs would sit cross-legged, smoking a joint and passionately discussing the evils of war, of government, of society; how they were the new generation, the generation that would change the world for the better. While waiting for the aged rockers to make their way to the make-shift stage, beside a bed of flowers just a bit west of dead-center in the park, I spoke with Karen, a woman who is a member of that counter-cultural generation (“we were occupying our universities!“), about some of the differences between the late ’60s/early ’70s and today and highlighted the focal point of the rebellious ire of that era: the military. “People were constricted,” she said. “And everyone had to go. Those variations in culture are hard to understand.” When Americans watched their fellow Americans – brothers, husbands, friends, sons; those who did not sign up for the Southeast Asian jungles – come home in body bags night after night while sitting around the dinner table, anger set in. And with that anger, mixed with the energy of the concurrent Civil Rights movement, the American culture – particularly music – altered the landscape. Thousands descended upon Haight-Ashbury; hundreds of thousands trekked up to Saugerties. Musicians were given a power unlike any they had before. They were influential and infallible. They led a generation. They were rock-stars. A couple of weeks ago, two musicians from an even earlier generation participated in an Occupy Wall Street march, as if to say to us young folk, “This is how you protest.” Pete Seeger and Arlo Guthrie, voices of many, are the progenitors to Bob Dylan, John Lennon, Bono, Bruce. But where are these voices today? My generation, a generation marked by bubbles and terrorism, commercialism and mass production, prescription drugs and bike helmets, doesn’t have a voice. What artists do we look to to push us, to calm us, to inspire us, to lead us? All the musicians we ask to do this – think of the MSG 9/11 concert – are those very rockers our parents grew up with. Of course, there are more genres of music today and more money to be made. A fragmented audience and an artist who may not want to trade his or her potential earnings in advertising for a political movement may play a part to the lack of voice for my generation. A superstar like Jay-Z can walk through Zuccotti Park and even wear a shirt supporting OWS, or Puff Daddy can get send out a message: Vote or Die (from the ’04 general election), but can they represent and speak to a generation? But even they’re older – Jay Z is 42 and Kanye is 34. For comparison, John Lennon was assassinated at 40 and Dylan wrote “The Times They Are A-Changin'” when he was 23. Maybe it’s not the artists themselves who don’t have a voice, but the flock, instead. Voter turnout among 18-30 year olds is anemic. In the 2010 midterm elections, only 20% of eligible voters went to the polls. Maybe my generation has become apathetic. We grew up in relative peace and strong economic cycles. We were coddled by the very generation who hoped they died before they got old. My generation had no cause. Until now. While no one can accurately predict how OWS will turn out, I hope we can turn some of this energy into creating not only lasting, but moving music, where 40 years from now, we pop on some artist from 2012 that has taken on the voice of a generation. My generation.